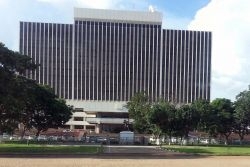 Lusaka is the capital city of Zambia. Home to almost 2 million people with an unemployment rate of around 60% Lusaka is actually a relatively safe city with most people doing their best to make a living in the "informal" sector. Every set of traffic lights has a number of vendors trying to sell everything from plastic clothes pegs to knocked off Monopoly sets. The roads are busy and one suspects a fair few of the drivers are holding driving licences of questionable origin. Never assume that because the traffic light is red the traffic will stop! Most motorists drive slowly, probably too slowly, but this does at least leave time to react when someone does something a bit silly. 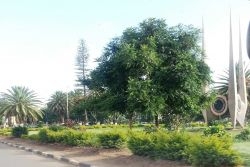 To most visitors Lusaka is a transit point, somewhere they have to go to catch their connection to the next destination but, for a few days at least, Lusaka has something to offer. Shopping is done anywhere and everywhere from a lady crouched on a pile of rocks selling a pyramid pile of tomatoes to modern shopping centres with exotic shops bursting with imported goods. You can explore some interesting markets selling a variety of crafts and curios, most notably the Pakati Market held every Sunday at Arcades Shopping Centre or, for more chaos and local atmosphere, Soweto Market and Kamwala Market in the City Centre. 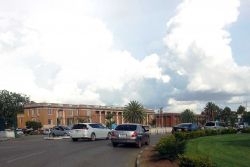 For history and culture, the National Museum is worth a brief visit and for an introduction to Zambian art there are a selection of art galleries showcasing local talent. The city boasts a wide variety of restaurants from global fast food chains to old favourites that have been around for years. A visit to the Elephant Nursery at Lilayi is a must and, although it is a bit of a trek, Kalimba Reptile Park is well worth the trip. Petty theft does occur but on the whole, Lusaka is as safe as most places. It is advisable not to wander around at night and if you are visiting the local sights avoid revealing clothing as this may cause offence, if possible go with someone – even if it is just to share the experience!